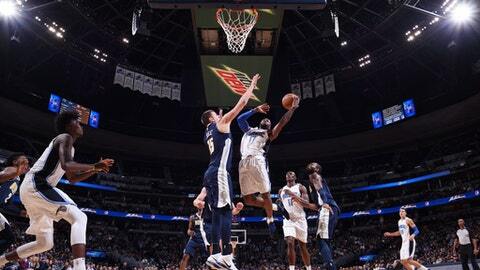 DENVER (AP) Jamal Murray scored a career-high 32 points, Will Barton had 26 points and nine rebounds – both season bests – and the Denver Nuggets beat the Orlando Magic 125-107 on Saturday night. Nikola Jokic had 12 points and 17 rebounds for his eighth double-double of the season and also added eight assists for Denver. Six Nuggets scored in double figures. Murray had 22 points in the first half to help Denver take a 70-47 lead and hit a basket late in the fourth to set his career high. Denver finished its season-long six-game homestand 5-1 and benefited from a shorthanded Magic team. Guards Elfrid Payton and D.J. Augustin didn’t play due to left hamstring injuries, and the Nuggets took advantage of their absence to score 70 points from their backcourt. Marreese Speights led the Magic with 19 points. Evan Fournier and Jonathon Simmons scored 18 apiece. The Nuggets took control with a 13-0 run late in the first quarter. Murray scored nine of his 16 points in the period during the run that gave Denver a 35-19 lead. The Nuggets put it away in the second quarter when Orlando went cold. The Magic had just one field goal for the first 6 minutes of the period when Denver built a 26-point lead. The lead grew to 30 in the third quarter but the Magic battled back to make it a 13-point game but never got closer. Magic: Payton didn’t play to protect against him aggravating the left hamstring that kept him out of eight games this season. ”One thing he hasn’t done since he’s been back is playing in a back-to-back,” coach Frank Vogel said. ”Traveling, arriving late at night, if he still has some tightness in there this is a concern. It’s not a setback, we’re just being smart with it.” … Augustin missed his fifth consecutive game. Nuggets: G Gary Harris did not play because of a shoulder injury. Coach Michael Malone would not say if Harris would miss more than one game. … Denver’s 70 points in the first half were its most for any half this season. Magic: Continue their four-game Western Conference road trip at Golden State on Monday night. Nuggets: Play at Northwest Division rival Portland on Monday night.